Barco ClickShare UK Gold partner and Wireless Collaboration Solutions for the Meeting Room. UK Reseller. Barco is a global technology company that designs and develops visualisation products for a variety of professional markets including entertainment & corporate, healthcare, industrial & government, and defense & aerospace. Barco’s provides the highest quality, user friendly imaging products and aim to provide customers with solutions to optmize productivity and business efficiency. VideoCentric begun working with Barco to provide wireless Presentation and Collaboration systems into customers boardrooms, meeting spaces and lecture theatres. The Barco ClickShare provided a high quality solution that VideoCentric recognised as a much needed component of tailored visual collaboration solutions. 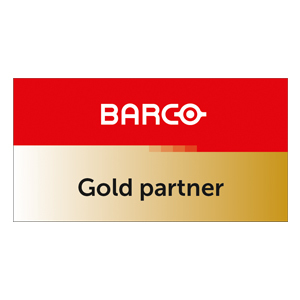 VideoCentric have been awarded Barco Gold Partner status, which demonstrates our commitment & investment in solutions that increase the effectiveness of collaboration in the workplace, whilst being able to support & maintain integrated solutions as customer sites. VideoCentric are 1 of only 12 partners to hold this expert level of accreditation, the highest level possible from Barco. VideoCentric also provide Barco solutions for specific verticals including Medical imaging projectors, DICOM standard displays and bespoke visual display systems.